★MATERIAL: Color Solar Panel + Plastic + High White Material Glass. ★SIZE: high*bottom width * top width -13cm * 6cm*6.5cm/6.3*2.36*2.60in. ★POWERFUL SOLAR PANEL: Get full charge within 5-8 hours under the sun, and lasts for 8-10 hours with full charge, energy saving. ★SCOPE: If you are looking to decorate a garden party, or need wedding decorations with a summer feel, or tree decoration ,a solar mason jar light brings the perfect mood to your gathering. ★GUARANTEE:100% Guarantee for long life used. Any problem can contact us first for free; we will give you a perfect solution and provide you the best customer service. Fairy Light Solar Mason Jar Lid Insert with Rechargeable Battery Auto Off/On Switch – Makes instant solar pathway lighting, solar garden lights Fairy Light Solar Mason Jar Lids can be added to most standard glass mason jars. 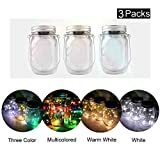 These easy to use color changing Fairy Light Solar Mason Jar Lid inserts come in a package of three. Each light has LED light strand with 5 color changing LEDs that quickly flicker between a random pattern of yellows, reds, blues, greens and purples. Each solar lid contains one AAA rechargeable battery, which will last for approximately 6 hours when fully charged. Simply open the jar and place the LED solar light into the Mason jar ring, and close the lid – instant Mason jar light! Each light has a built in light sensor so that it automatically turns on in the evenings as the light dims.